Being a documentary wedding photographer isn't as easy as it sounds. On the face of it, it should be a walk in the park - turn up to a wedding, try to blend in, take photos without people knowing then go home. In truth, it's the documentary part of wedding photography that is actually the most difficult. You need to rely on your senses and your intuition, honed through many years of attending and photographing weddings to know to be in the right place at the right time, and that doesn't come easily at all. You also have to learn to be discreet; It's no good just walking around and pointing your camera at people and things, because as I'm sure everyone reading this will have experienced at some point in their life - the second you point your camera at something, you alter the scene that you're looking at if they notice that you're there. All of a sudden that natural moment has gone forever. Vicky and David's wedding took place at Kempsey Church, with their reception being held at Manor by the Lake in Cheltenham. 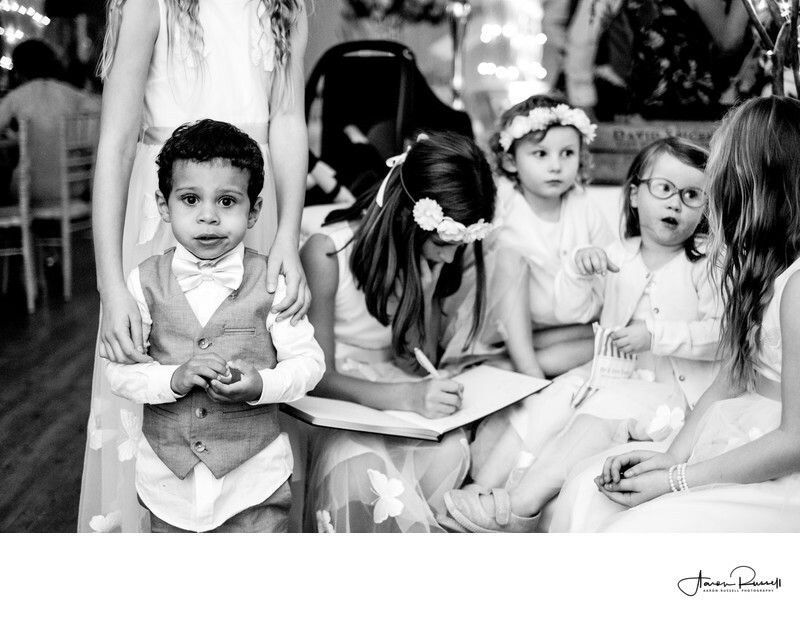 During their wedding reception, just before the time when the first dance was due to take place I was walking around looking for things to document (after all, every photo a 'documentary wedding photographer takes needs to tell a story) when I noticed the page boy looking bemused, surrounded by flower girls and looking as if he feels completely out of place. I dropped to one knee in order to put myself on his level and raised my camera. He looked me square in the eye/lens as if to silently say 'help!' and the resulting photo is an instant classic. I think it was really important here that the bridesmaids/flower girls remained unaware of my presence, as being noticed would have totally changed the feel of the scene. Children are forever being asked to smile for cameras, but in situations like this one that is actually the last thing that you need!